Prior to 2003, the best team in Monarchs' history was probably 1981. 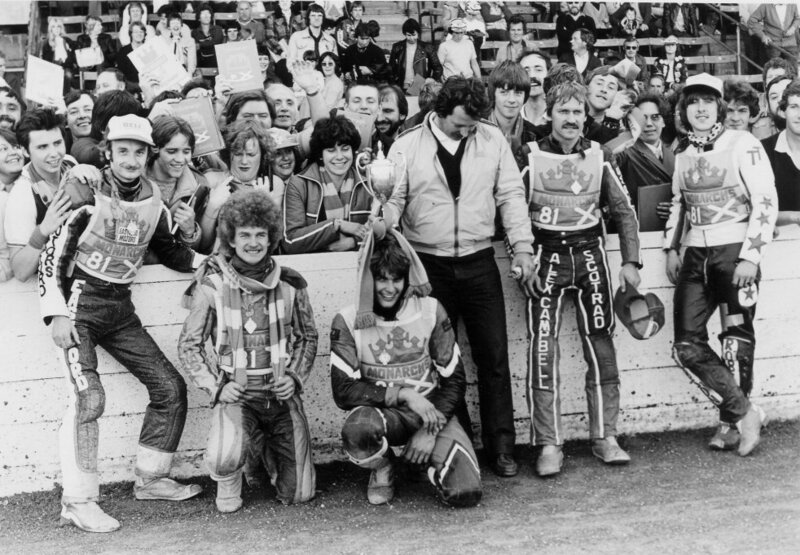 Although only fourth in the final National League table, they were good enough to have won it with Neil Collins showing dazzling form, backed by the experience of Dave Trownson and George Hunter plus accomplished riders Chris Turner and Ivan Blacka. Reserves Benny Rourke and Roger Lambert were no mugs either. We did win two national competitions - the KO Cup and the Fours. This photo shows the winning Fours team at Peterborough on 26th July, celebrating with some of our travelling support - Trownson, Collins, Turner, team manager Doc Bridgett, Blacka and reserve Guy Robson.